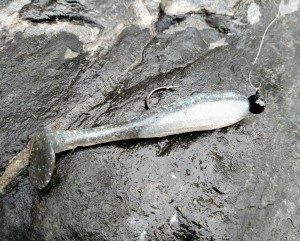 7 Fifteen Baits In Action! 7 Fifteen Baits in the air! I was first introduced to swim baits back in 2003. Since then I have fished them both for fresh and salt water fish. These lures will catch you more species of fish than just about any other lure on the market today. If you don’t believe me, than you probably have not fished them with any regularity. Well I’m hoping this short review will change your mind. 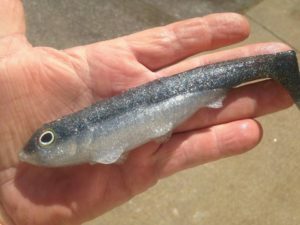 I found 7 FIFTEEN baits as I find a lot of smaller lure companies, by searching the internet for anything new. The plastics markets is a solid one and several major companies hold the majority share. However some of the smaller companies are the ones that are not only very innovative, they create lures to be better than ones they themselves have fished. 7 FIFTEEN baits owner Lane Rochester is one of those anglers. As much as he loved swim baits, he was amazed that even bad ones catch fish. He knew he could make a better mouse trap and after fishing them, I can honestly tell you that he has done just that. I’ve been fishing some of his creations including the Lowedown 4.25 and the 3.0. Both are incredible baits that seem to come to life even at painstakingly slow speeds. 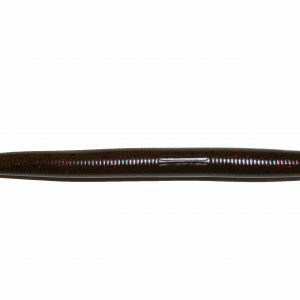 If you are a swim bait freak like I am, you know, or need to know that one of the most successful ways to fish these baits is painfully slow. Hand poured baits such as these were developed by Mr. Rochester with fantastic tail action because if there is too much plastic between the main body and the tail section you need a faster retrieve to achieve motion. The body also becomes ridged with little or no movement making the baits less effective overall. The 7 FIFTEEN models are very soft and since they can be retrieved at ultra-slow speed the body will rock back and forth adding to the life like appeal. They truly seem to come alive in the water. The 3.0 may be one of the finest swim bait for small mouth and spotted bass I have ever seen. It will be a killer for white bass as well as stripers on an A-Rig as well. Other models including the Lowedown, Lowedown Jr. and the Big Nasty will be fish catchers for multiple species of fish. I have a good supply and will be adding more to my collection. You need to experience the quality and precision that these baits have to offer. 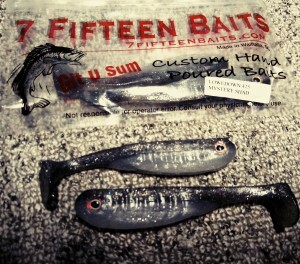 Do yourself a favor, check out www.7fifteenbaits.com and GET U SUM!